At the invitation of Foreign Minister Wang Yi, Italian Minister of Foreign Affairs and International Cooperation Angelino Alfano will pay an official visit to China from December 17 to 19. During the visit, Foreign Minister Wang Yi will hold talks with Minister of Foreign Affairs and International Cooperation Angelino Alfano and they will exchange views on bilateral relations and issues of mutual concern. The two foreign ministers will also attend the 8th joint meeting of the China-Italy governmental committee. Currently, the China-Italy relationship is developing smoothly. The two sides have enjoyed frequent high-level interactions and solid mutual political trust, achieved fruitful outcomes in practical cooperation in such fields as economy, trade and investment, science and technological innovation and cultural and people-to-people exchange and maintained sound communication and coordination in international affairs. We hope and believe that Foreign Minister Angelino Alfano's visit to China this time will further consolidate and deepen the traditional friendship between the two countries and two peoples, step up our strategic synergy and across-the-board pragmatic cooperation under the Belt and Road Initiative and promote greater development of the China-Italy Comprehensive Strategic Partnership. Q: According to the reports of Japanese Kyodo News Agency, former US chief negotiator for the Korean Peninsula nuclear issue Robert Gallucchi advises that the US and the DPRK should take heed of the "suspension for suspension" proposal put forward by China and he believes that the DPRK may go for denuclearization if mutual trust is established between the US and the DPRK through dialogue. Robert Gallucchi led the negotiation between the US and the DPRK in Geneva and the signing of the Agreed Framework of 1994. What's your comment on his remarks? A: The "suspension for suspension" proposal put forward by China has won the understanding and support from a growing number of countries and insightful persons. You may also notice that in his speech at the opening of Symposium on International Developments and China's Diplomacy in 2017 on Saturday, Foreign Minister Wang Yi mentioned the "suspension for suspension" proposal once again. He pointed out that on the nuclear issue of the Korean Peninsula, we have kept firmly in mind the goal of upholding the international non-proliferation regime, safeguarding peace and stability of the Peninsula, and achieving the denuclearization of the Peninsula, and stayed committed to resolving the issue through dialogue and negotiation. At the moment, the situation on the Korean Peninsula, which has been caught up in a vicious cycle of provocation and confrontation, has remained grave. However, it is important to highlight that the hope of peace remains alive, and the possibility of negotiation still exists. War is by no means acceptable. 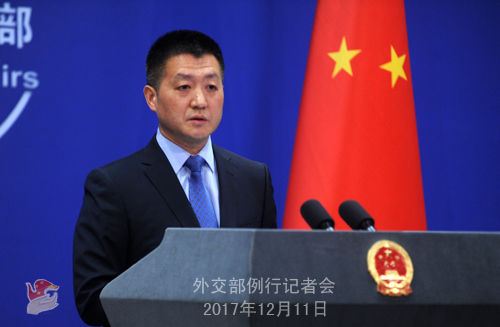 China approves of taking concrete actions to curb the DPRK's nuclear and missile development, and we have put forward the "suspension for suspension" proposal with the aim of creating conditions for resuming dialogue and negotiation. Just like what Foreign Minister Wang Yi said the day before yesterday, going forward, parties need to give serious consideration to China's "suspension for suspension" proposal, take the first step toward de-escalation to at least take the situation out of the "black hole" of confrontation, and endeavor to create the right conditions and atmosphere for the resumption of dialogue and negotiation. I agree with Mr. Gallucchi's opinion that both the DPRK and the US are the directly concerned parties of the Korean Peninsula nuclear issue and they hold the key to resolving the issue. We support and hope that the two sides can build up mutual trust and improve relations through direct dialogue and engagement so as to create necessary conditions for the final settlement of the issue. Q: It is conjectured that the White House may appoint Republican Senator Tom Cotton as the Director of Central Intelligence Agency. Tom Cotton recently said to the media that for many years, China hasn't truly helped the US to settle the Korean Peninsula nuclear issue. Instead, it has secretly undermined the efforts made by the US and sought to profit from the contradictions between the US and the DPRK. What is your comment on this? Does China believe that some forces in the US are getting tougher and tougher with China? If these forces could bear on the US foreign policy and resorted to tougher rhetoric and actions against China, what would the Chinese side respond to that? A: You raised a couple of questions. I would like to take your questions from the following three perspectives. Firstly, with regard to the personnel appointment in the United States, this is its domestic affairs and we are not in the position to make comments. Secondly, regarding China's role on the Korean Peninsula nuclear issue, in fact, taking stock of the evolvement of this issue over the past few decades, we can gain a clear understanding that it is due to China's unremitting efforts, especially within the framework of the Six-Party Talks proposed by China that we have achieved tangible progress in the denuclearization of the Korean Peninsula. Apart from that, we haven't seen any progress made on this issue by any parties by provoking or threatening each other. In view of this, I hope that if relevant parties really want to resolve the Korean Peninsula nuclear issue and realize the denuclearization of the Peninsula, they might as well ponder on what is the real effective solution to this issue. Thirdly, as for the hard-line position or other positions that might be held by some forces in the US government in this aspect or other aspects, we will not make any prejudgment. What I would like to say is that over the past nearly forty years since the establishment of China-US diplomatic ties, the growth of China-US diplomatic relations is mutually beneficial in nature and has delivered tangible benefits to the two peoples. I believe that, whoever from the two governments, as long as they can truly proceed from the interests of its own people and world peace and development, they will make a right choice on China-US relations. Q: According to media reports, an assault on December 7 targeted at eight UN peacekeepers in North Kivu province, which is located in the east of the Democratic Republic of Congo (DRC), has killed 14 Tanzanian peacekeepers and five soldiers of the DRC. UN Secretary-General Antonio Guterres said that this is the deadliest single attack on a UN peacekeeping mission in recent memory. What is your comment on this attack? A: The Chinese side condemns the attack targeted at the UN peacekeeping mission in the DRC, mourns for the victims and conveys condolences to the bereaved families. The Chinese side is willing to continue stepping up cooperation with the international community and play a positive role in promoting the peaceful settlement of the issue of the DRC and safeguarding the peace and stability of Africa and the Great Lake Region. Q: On December 9, in an address to the nation aired on Iraqi state television, Iraqi Prime Minister Haider al-Abadi says Iraqi government forces retook the last "Islamic State" (IS) stronghold in the country on that day and secured the country's border with Syria. Iraq declared that the fight against the IS is over. What is your comment on this? 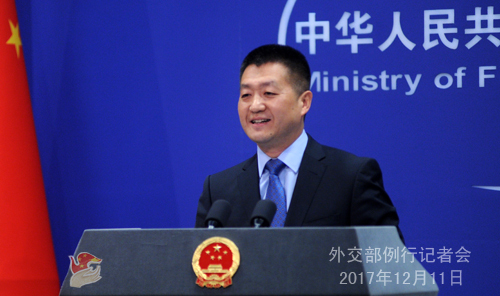 A: The Chinese side congratulates Iraq on scoring a major victory in its fight against terrorism, which also represents a positive progress in the international counter-terrorism cooperation. The Chinese side will as always support the efforts made the Iraqi government to uphold national stability and promote economic reconstruction. We hope that Iraq can achieve national stability and development at an early date. Q: According to media reports, Pakistan and China last month held a meeting of a joint coordination committee on the China-Pakistan Economic Corridor (CPEC), during which the security issues relating to the CPEC and the Chinese citizens were discussed. What is your comment? A: The China-Pakistan Economic Corridor (CPEC) is a major cooperation project for strategic alignment between China and Pakistan, which has won extensive support from people of both countries and will strongly promote prosperity and stability of China, Pakistan and other countries in the region. We commend Pakistan for attaching great importance to and making all-out efforts to protect the safety of Chinese organizations and personnel in Pakistan. We believe that Pakistan will continue with concrete and effective measures to ensure the safe and smooth progress of the CPEC. Q: First, according to media reports, the US, Japan and the ROK will conduct missile tracking exercises in the upcoming two days, the sixth of its kind. What's your comment on this against the backdrop of the current situation on the Korean Peninsula? Second, according to media reports, German intelligence institutions said recently that their Chinese counterparts have identified at least 10,000 Germans as potential informants to be recruited via social media. Head of the German intelligence institutions said this is a serious problem. What's your response? A: On your first question, it seems that you also believe under the current situation on the Korean Peninsula, it is worth paying attention to that the US, Japan and the ROK have conducted such military actions for multiple times. 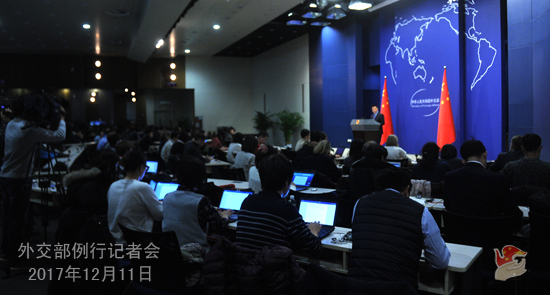 We think that, just as Foreign Minister Wang Yi pointed out at the opening of the symposium on Saturday, the situation there now is caught in a vicious cycle of provocation, which is not conducive to regional security and stability. I believe that it surely serves no one's interests if this vicious cycle sparks a conflict accidentally or even leads to war or conflict. Therefore, under the current circumstances, the relevant parties should comprehensively, fully and strictly implement the DPRK-related Security Council resolutions and do more to contribute to regional peace and stability and bring back relevant parties back to the negotiating table rather than provoke each other to the opposite. On your second question, the allegation of the relevant German institutions is nothing but making groundless accusations on hearsay. We hope Germany's relevant institutions, in particular its governmental departments, should speak and act more in a responsible way, and stop words and deeds detrimental to China-Germany relations. Q: Firstly, do you have more details about the agenda of the meeting between Russian, Indian and Chinese Foreign Ministers? Secondly, at the weekend, Australian Prime Minister Malcolm Turnbull made some further strong comments against Chinese criticism of their new reforms to their espionage and foreign interference legislation. Do you have any further comments? A: With regard to your first question, we have issued the relevant information on Foreign Minister Wang Yi's attendance at the Russia-India-China Foreign Ministers' Meeting. If we have detailed information about the discussion, we will release it in a timely manner. The foreign ministers of the three countries will certainly have a thorough exchange of views on current international and regional issues and on how to better promote the communication and coordination and enhance effective cooperation among Russia, India and China, the three emerging markets on major international and regional issues under the current international situation. After the meeting, we will release the relevant information in a timely manner. As to your second question, we have taken similar questions for multiple times recently so I won't restate that. You may have also noticed that the relevant remarks of the Australian leaders have aroused attention in China. We advise them to refrain from those remarks that are detrimental to their own images and China-Australia relations. Q: Recently, certain US scholars and former officials said that it's no longer realistic for the US to obstruct or curb China's development and the only choice is to gradually adapt to an ever stronger China. The US needs to look at China with first-hand observation and experience and come up with new China policy. What's your view on this? A: We usually don't comment on the opinions of scholars, yet we agree with the idea that the US should keep up with the times when it comes to its China policy. As Foreign Minister Wang Yi said in his speech at the opening of Symposium on International Developments and China's Diplomacy in 2017 on Saturday, China and the US need to better get along with each other, seek common ground and pursue win-win cooperation. Foreign Minister Wang Yi said that the two countries' interests have been tied more closely together and there is far more that we share than we disagree. Cooperation leads to win-win outcomes while confrontation can only result in a lose-lose situation. This is a plain truth that anyone with a strategic vision and sober mind will recognize. It is a trend that will not bend to the will of any individuals. He also clearly pointed out that China has no intention to change or displace the United States; the US cannot expect to dictate to China or impede its development. For both countries, the old-fashioned mentality of zero-sum game and confrontation works no longer. Putting aside differences, seeking common ground and pursuing win-win cooperation are the only right choice for a bright future. Foreign Minister Wang Yi said that China and the US need to find ways to better get along with each other. China is willing, on the basis of mutual respect, to live peacefully with the American superpower. The US needs to understand and accept a China that is following its own path of socialism with Chinese characteristics, one suited to its own conditions. When engaging with each other, both countries must observe the rules, by which I mean the commonly recognized international law and basic norms governing international relations, the purposes and principles of the UN Charter and the three joint communiqués between China and the United States. Q: According to media reports, a Chinese diplomat in the United States on Friday said that if the US military has ships that visit Taiwan as authorized in the 2018 US defense bill, then China would take Taiwan by force. Does China stand by this? A: The position of the Chinese government on the Taiwan issue, which I believe you and all the journalists here are quite clear about, is consistent and clear. We will continue adhering to the policy of "peaceful reunification and one country, two systems" in an effort to advance the peaceful development of cross-straits relations and promote the process of peaceful reunification of our motherland. Meanwhile, we will firmly uphold national sovereignty and territorial integrity and never tolerate the recurrence of the historical tragedy of national division. I also want to stress that China always opposes official exchanges and military contact of any form between the United States and Taiwan. 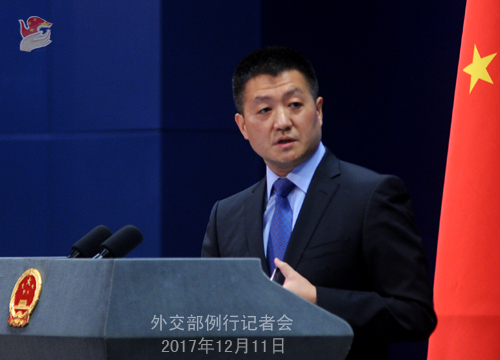 We urge the US to abide by the one-China principle and three China-US joint communiqués and the US must prudentially and properly handle Taiwan-related issues. Q: According to reports from the Financial Times, New Zealand's security agency has asked the New Zealand government to address espionage by foreign states and foreign efforts to interfere in New Zealand politics. That criticism appears to be directed at China, according to experts cited in that report. What is your reaction to that criticism? A: Firstly, what you mentioned is the reports of the Financial Times and we have not seen that the New Zealand authorities made such kind of remarks on this issue. Secondly, recently certain people in quite a few western countries are interested in whether other countries will interfere in their internal affairs. We think that if the "non-interference in other countries' internal affairs" has really cast a deep impression in the minds of certain people in these countries, then it is a good thing because this is one of the basic norms governing international relations enshrined by the UN Charter. As for the Chinese side, I can assure you that since the founding of the People's Republic of China in 1949, while pursuing an independent foreign policy of peace, we have always abided by the principle of non-interference in other countries' internal affairs when developing relations with other countries. We will not meddle in other countries' internal affairs, and meantime we will by no means allow other countries to interfere in China's internal affairs.